On 27th June the Master and his Lady were given a fascinating tour of Trinity Hall by the Deacon Convenor David Parkinson (www.seventradesofaberdeen.co.uk). The building represents a rich heritage stretching back to the 11th Century. 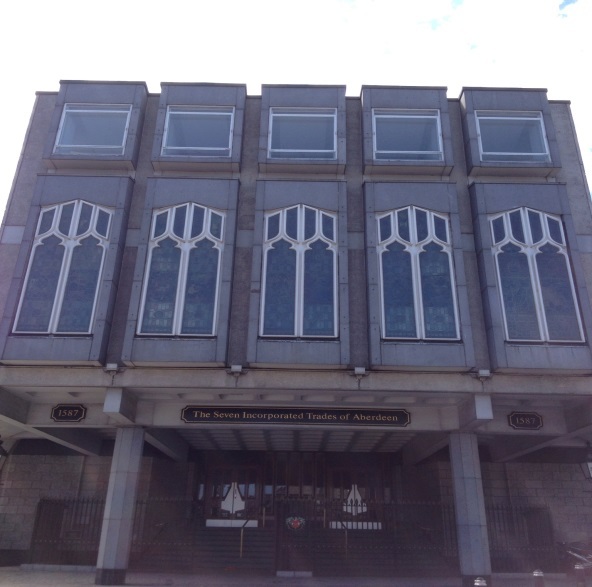 From the outside, five of the seven beautiful stained glass windows, one for each trade, are visible. The founding members banded together in the belief that strength in numbers would provide them with a united voice on matters related to work, and that their commitment to quality workmanship and the honing of specialist skills through apprenticeships, would set an enduring benchmark. Their coat of arms shows that one arrow alone is easily broken, but when held tightly together, it is almost impossible to break a group of arrows. 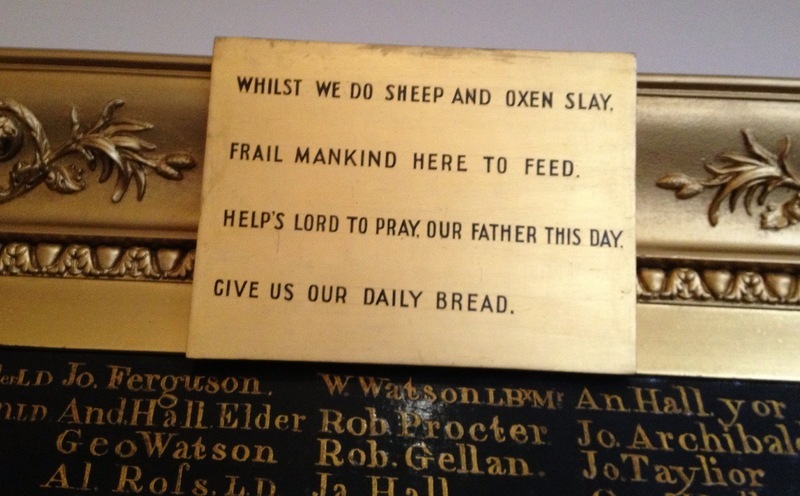 The Fleshers were added to the membership in 1657 making the seventh trade. The Fleshers drawing its skilled men from the butcheries and slaughterhouses of the burgh, had first been incorporated as a trade in 1534. It became custom for new entrants to provide a lavish banquet as part of their acceptance, making use of their renowned produce. 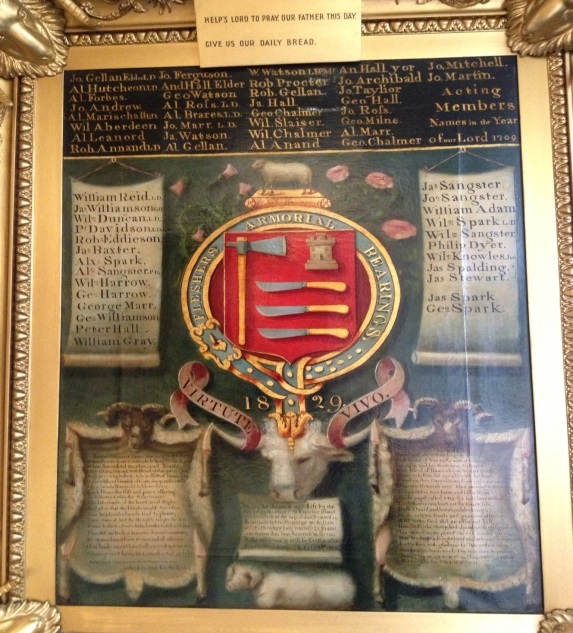 The oil painting depicts their coat of arms, and an old Grace is appended over it. 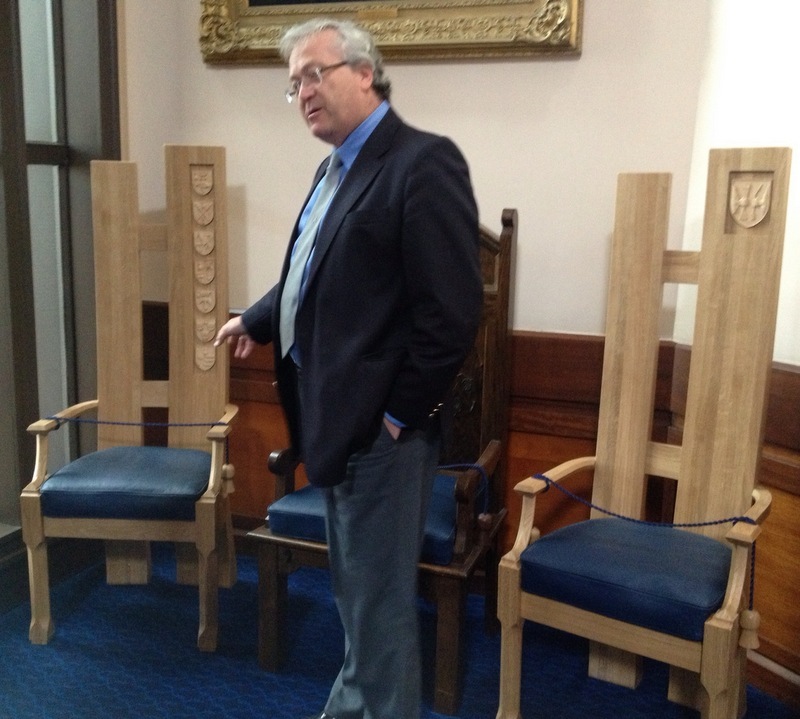 The Fleshers Entrant’s Oath is reminiscent of that of the York Butchers’ Gild, and the Master’s Chair dates back to 1661 ( - apparently it is very uncomfortable!). 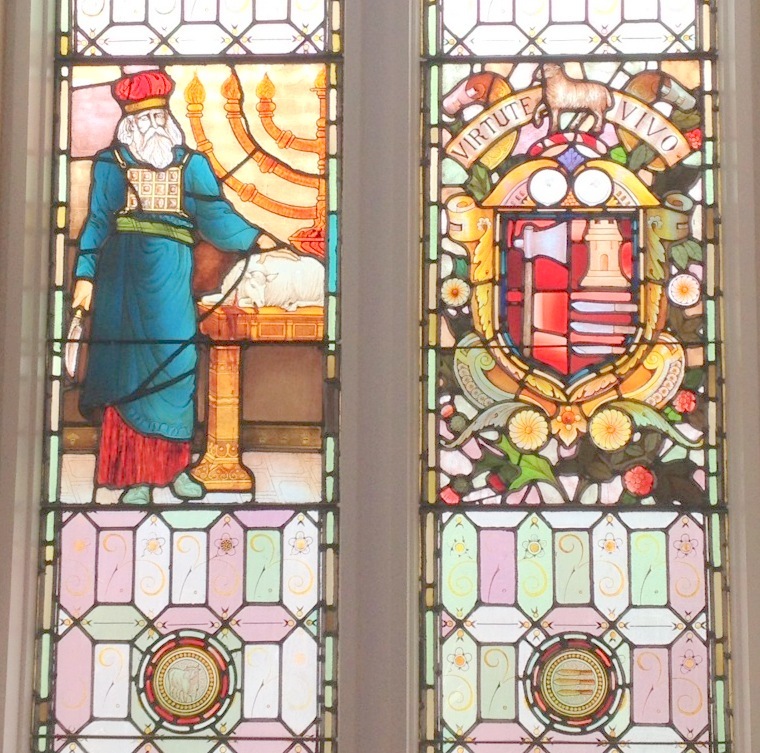 Each of the Seven Trades has a stained glass window in the Great Hall, and all save one include a biblical context. 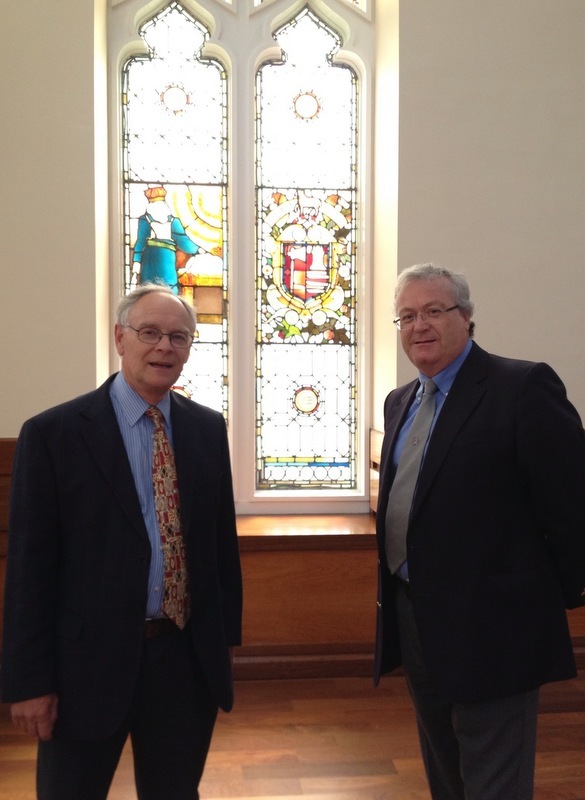 These beautiful windows are a rare example of the work of Stephen Adam. The Seven Trades are: Hammermen, Bakers, Wrights and Coopers, Tailors, Shoemakers, Weavers, and Fleshers. 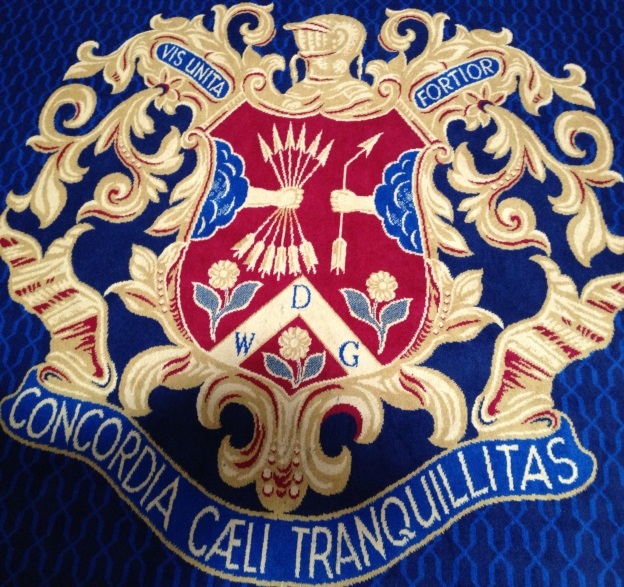 The Deacon Convenor oversees all the Trades and is a position held by a member of one of the Trades for two years. In the next photos the Master and the Deacon Convenor are standing in front of the Fleshers stained glass window, and a close up shows the Fleshers Arms in the right-hand panel, and the biblical theme of the lamb on the altar in the left-hand panel. 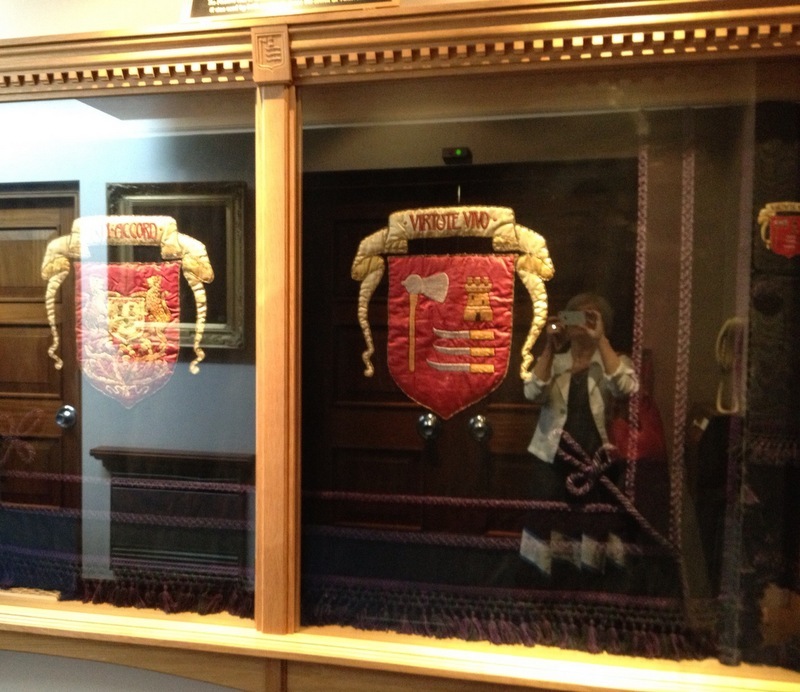 Among the many artefacts beautifully displayed in the various rooms, is a glass case containing the Fleshers Mort Cloth. This is a dark purple cloth, embroidered with the Fleshers’ Arms, that earned money for the Fleshers because it was hired out to be draped over coffins of revered Fleshers, with separate charges being made for draping over the coffin in the home, during carriage, and in church. One of the several rooms in the Hall is the Essay Room. This houses some examples of ‘essay pieces’ of exquisite workmanship which have been made by individuals to demonstrate the quality of their skill, and which have formed part of their acceptance into their Trade. 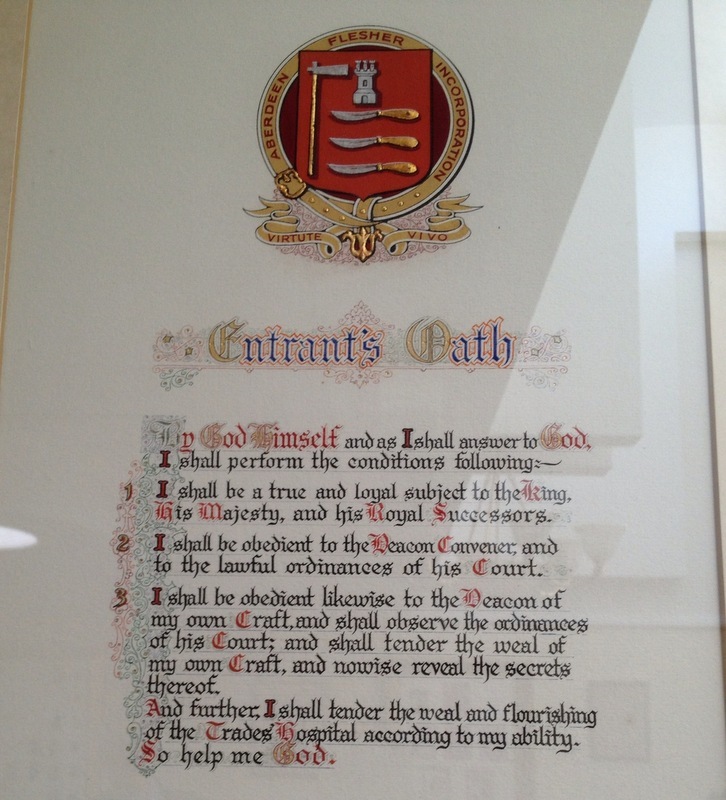 This picture shows an essay piece made for acceptance into the Wrights and Coopers Trade. 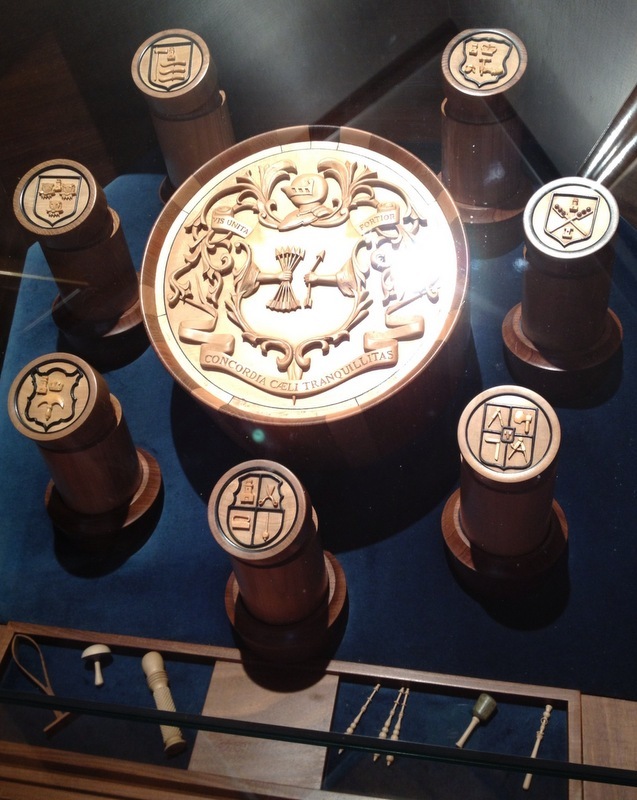 The Seven small barrels (about two inches in diameter) each have a lid carved with one of the Trade Crests (Fleshers is top left), and they all fit into the large barrel in the centre which in turn is edged with seven types of wood. Each small barrel contains miniature tools, all hand crafted, which are representative of that particular Trade, and some are displayed at the bottom. 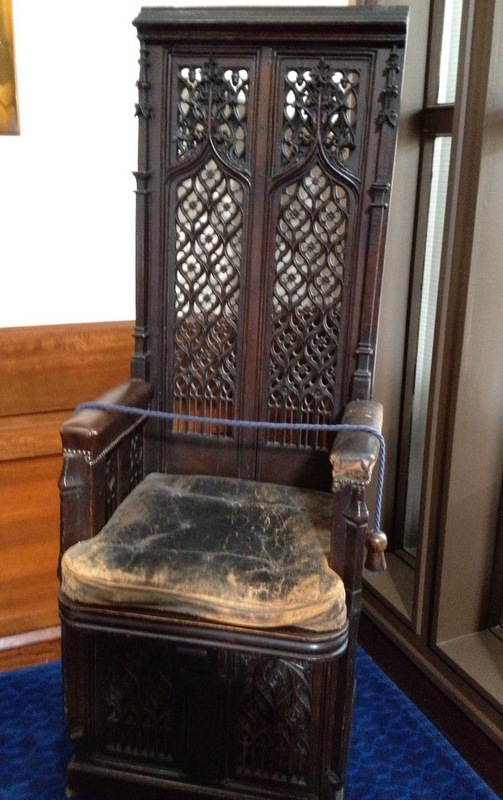 The Deacon Convenor until recently held his meetings while seated in the Deacon Convenor’s Chair which is over 500 years old. 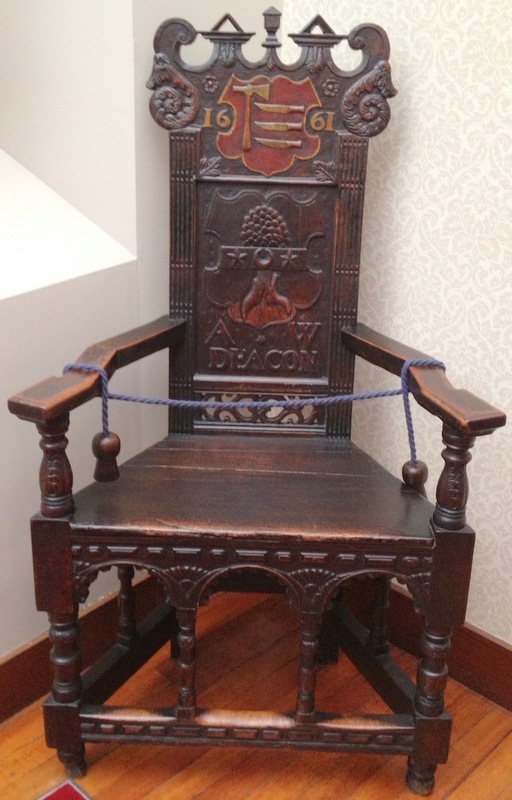 However new chairs have been made recently – one for the Deacon Convenor himself and bearing his Arms, and one for the Masters of the Trades with each of the Seven Arms carved into the back. The Master was pleased to be able to present the Deacon Convenor, David Parkinson, with a copy of the History of the York Gild of Butchers, and a Gild bow-tie as a token of thanks for the wonderful tour and detailed historical explanations he gave.